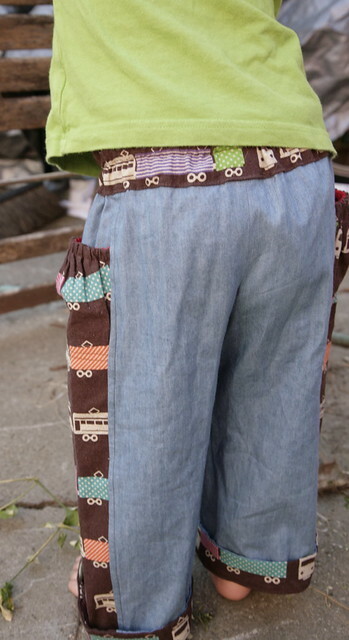 Inder Loves Folk Art: One-Two-Three Train Pants. As mentioned in a prior post, Boy, Oh Boy, Oh Boy! 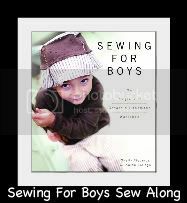 is currently hosting a Sewing For Boys Sew-Along. I'm way late to this party, since they started sewing way back in January, but when I saw that the Treasure Pocket Pants were the pattern for April, I decided to jump on board. I have been planning to make the Treasure Pocket Pants for a while now (so many cute examples on the 'nets! ), but didn't get serious about the project until I saw this Echino train fabric. Ha! The perfect contrast pocket fabric for my train obsessed little boy! So without further ado, here are Joe's new Choo-Choo Pocket Pants. And some serious bedhead. 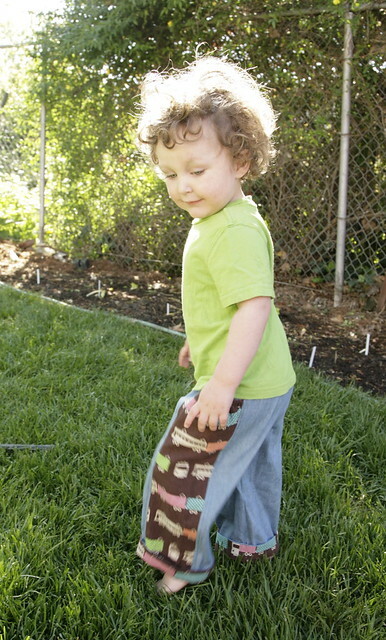 These pants are loud and proud - the sort of thing that you can really only get away with when you're a little kid. But hey, you have to take advantage of that time. I opted to use a lightweight chambray/denim for the main fabric, thinking it might tone down the loudness of the train print. Hahahaha. Not sure that happened, but the weight makes these the perfect cool, breezy summer pants. Size 2/3 is quite generous on my solidly 3T little boy. Not only do the pants have a lot of ease (which is nice on a hot day), but they are long - I have turn up the cuffs on Joe. In addition, the amount of elastic suggested by the pattern resulted in a very loose waistband on Joe, and I had to tighten it up considerably. I think these would have been pretty big on Joe back when he was closer to 2T. But of course, it's always nice to make something that will get a good amount of wear before it gets too small. I love the train waistband. 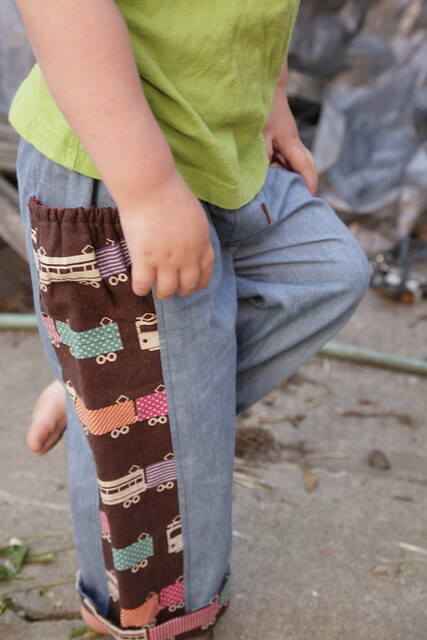 Joe was initially hesitant to wear these, since apparently he preferred to just look at the fabric in my stash and count the train cars (Joe can now count to nine!). The idea that his favorite fabric had magically morphed into pants was confusing and just didn't sit right with him (I can't really blame him - I still think it's magic, too!). 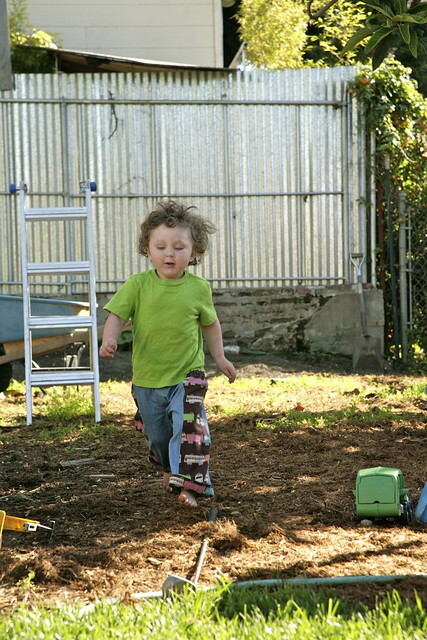 But then this morning, he was willing to put them on, and after breaking them in running around the backyard and filling the pockets with rocks, I think he is reconciled to his "one-two-three train pants," as he is calling them now. He might even like them a little. It is a blazing hot day in Oakland, a gorgeous "summer" day in April. We have to enjoy hot weather when we get it, because our actual summers tend to be chilly and foggy. The garden, the dogs, and the humans are just soaking up the sun today. I just posted about my pair of these today too. I love your pair - that Echino train fabric is really cute and Joe looks adorable in them. They look great with the cuffs showing too. It's funny, all the boys I know are, or were at one point, obsessed with trains but none of the girls. We actually have a train track run past down the bottom of our garden and my boys love it. It shows how their hearing is better than ours too - Casper will tell me a train is coming several seconds before I can hear it. I'm pleased to hear he's decided he quite likes wearing them. I hope you had a lovely day in the sun. We live a couple miles from some railroad tracks that run along the San Francisco Bay, and Joe never fails to hear the train whistle, even from that distance. He can also hear a garbage truck coming from about a mile away, which makes trash pickup morning, when they get started around 6 a.m., SUPER FUN. Joe will pull himself out of deep sleep to say, excitedly, "gaga guck!" (translation: garbage truck) and Steve and I will be like, "eerrrrrrrgggh, it's 6 in the morning, kiddo!" But oh, to be so easily amused, right? I love your pair too! Yours are less crazy-loud. I have this idea that these pants would be awesome in all one fabric, too, for a more toned down look. You are right, the chambray is nice next to the print and I have to agree, there's no better time for kids to dress 'loud and proud' than now. They're so uninhibited! Ha, yes, Joe's initial objection to these pants certainly had nothing to do with the fact that they make him look kind of like Elvis! There is something really special about the innocence and just general joie de vivre of this age. Oh, I love them, and I'm glad he came around to the idea of them! Sometimes it takes a little time to 'break the ice' with a new garment. And I totally agree about dressing them loud while you can get away with it. Go for it! I'm learning that Joe will usually come 'round to a garment eventually. But it can be frustrating waiting when you've made something adorable and you want to blog about it! I also really like the waistband, how the trains seem to be going across it. And the cuffs as well. Really cute pants! the pants are perfect - and probably every little boy's dream come true!